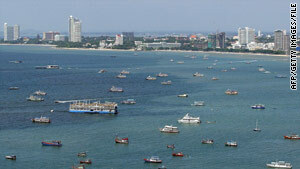 The seaside resort town of Pattaya has seen a significant dip in tourism. (CNNGo) -- Images of flaming tires, blood-covered bodies, armed soldiers and grenade-riddled buildings may dominate local and international media these days, but in the rest of Thailand -- and even most parts of Bangkok -- life is carrying on without any signs of the clashes. That's not to say residents aren't suffering, particularly in the country's major resort areas where international tourists are scarce. CNNGo asked residents in some of Thailand's popular holiday areas what the mood is, and if they're feeling the heat from Bangkok's violent situation. Alan Morrison, editor of Phuketwan.com, says Phuket is the peaceful tropical holiday island paradise it always has been, "but some people seem to think it's close enough to Bangkok to be dangerous." "It's such a shame that travel alerts don't always distinguish between the safe parts and the spots where snipers and tire-burners do their thing," he says, referring to the many government advisories that warn their citizens to avoid travel not just to Bangkok, but Thailand on the whole. "Rates at four- and five-star resorts on Phuket and along the Andaman coast are likely to be fantastic for travelers in the next few months. If you've ever wanted a luxury holiday with all the extras, now's the time to plan it." Online travel guide Travelfish.org recently published a piece titled: "Should I cancel my trip to Thailand? No. Should I cancel my trip to Bangkok? Yes." Though it warns that the violence is localized to a few areas of Bangkok, the article says "the situation is extremely volatile and could spread quickly and without warning. "If you've already got a holiday planned to Thailand, you don't need to cancel it, but you do need to rejig your holiday so as to spend as little time in Bangkok as possible." The site offers tips for travelers on how to get out of the city and suggestions on close places to go, including Kanchanaburi and Koh Samed. Hua Hin, about 200km south of Bangkok, is one resort town that is benefiting from Bangkokians' desire to get away from the chaos, says 11-year Hua Hin resident Martin Young, who works for Asia Times Online. "From a foreign tourism point of view the town is dead. However the loss of business by Thai establishments is being made up for by domestic tourism," Young says. "Bangkokians are fleeing the city in droves and their favorite destination seems to be Hua Hin. Both locals and expats alike are pretty much sick of it all and want the situation to end quickly so that business can return to normal. Being a tourist town it is hurting at the moment and local businesses are counting the pennies. There is no sign of any protests or insurrection here, though." In an interview with CNN last week, Thai Finance Minister Korn Korn Chatikavanij said the protests had taken between 0.3 percent and 0.5 percent off the nation's gross domestic product for the year and would have an "incalculable impact on investor confidence." "Clearly the impact on the economy has been the impact on tourism," Korn said. "Obviously pictures that are appearing on TV screens across the world have spooked potential tourists. Several governments have issued travel warnings for Thailand as a whole and we've seen bookings disappear at least for the months of June and July." Pattaya, Thailand's most infamous seaside resort, notorious for its go-go bars and wild nightlife, has been particularly hard hit by the ongoing situation. Pattaya resident Pojanee Muangkaew's family owns a scuba diving and tour company there. She says things have gone from bad to worse in recent weeks, with international tourists growing scarcer by the day. "On a normal month we'd each walk away with 100,000 baht. Last month, since the protests began, that dropped. This month, it looks like we'll be losing money. If things don't improve, we're going to have to close down. Even though this is the low season, the number of tourists has dropped to less than half of what we'd usually get this time of year." Up north in Chiang Mai, where support for self-exiled former prime minister Thaksin Shinawatra is prevalent, there is none of the civil unrest found in Bangkok, says long-time Chiang Mai resident and business owner Andrew Bond. "Even the usual ongoing protest forum behind Phra Singh Temple by the UDD has been abandoned as most [red shirts] have gone to join the Bangkok group," Bond explains. "The city is going about its business and uninformed tourists wouldn't suspect there's a national crisis." Bond notes that even though two grenades went off outside banks in the early hours of Monday, "probably in response to Seh Daeng's death," no one was hurt and other acts of civil terror haven't been reported lately. "I'm also meeting lots of ordinary Thais in this Thaksin stronghold who express strong disapproval at what the red shirts are doing," Bond says. Thai Chiang Mai resident Therapat Poomstitpong agrees with Bond, saying that the only evidence he's seen of the protests is what appears on TV screens and the front pages of the daily newspapers, but unfortunately the tourists are staying away. "It's sad, as there aren't many foreign tourists. Everyone is so tired of the violence, most of us want it to stop," the ice cream vendor says. "I just wish the red shirts would stop protesting and go home, before more people have to die." In Bangkok itself, life has been put on hold for many. On Tuesday the government extended the public holidays for state agencies for the remaining three days of this week, reports The Nation, as the violent street clashes are unlikely to end within the next few days. The BTS skytrain and MRT subway systems remain closed, too. That said, Bangkok is a large, sprawling city, so away from the main trouble areas life hasn't changed. CNNGo contributor Greg Jorgensen lives in Bangkok's Yaowarat neighborhood, aka Chinatown, where he says there is no sign of the unrest despite events taking place just a few kilometers away. "My little neighborhood on the river in Chinatown is business as usual -- kids playing in the street, dogs snoozing in the shade, food being cooked and eaten, and people running to and fro with work," he says. "Much like water, which simply moves around an immovable object, Thais have the remarkable ability to continue their routine in the most challenging of circumstances. Bangkok has several areas that are definitely dangerous, but in all others, life continues unabated."